The Moon - Earth's only natural satellite. The Moon makes a complete orbit around the Earth in average every 29.53 days. The Moon is in synchronous rotation, which means it rotates about its axis in about the same time it takes to orbit the Earth. This results in it keeping nearly the same face turned towards the Earth at all times. 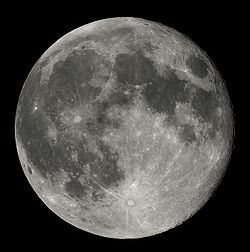 The diameter of the Moon is 3476 km (2,160 mi) and it's distance from Earth is about 30 Earth diameters or 384.000 km (238,857 mi). 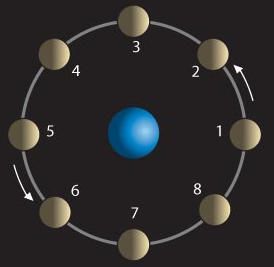 With its gravitational force the moon influences the Earth e.g. the tides on the oceans. More about the Moon at Wikipedia. The following graphics simulates the Sun shining from the right hand side. From 1=New Moon to 5=Full Moon (waxing) and 5 back to 1 again waning there is a monthly cycle of the Moon available to watch from Earth. Here you may find more Infos about the Moon phase. The following graphic symbol is used to show the state of the current moon cycle. Moon is about 51 %. Générer cette page a eu 0.0083 secondes.